Business attire can be expensive but is essential to for many men in an executive or sales position. Here are tips and advice for finding a good quality and well fitting suit. This is a guide for saving money on men's suits. The common idea that men and women should purchase one pre-packaged matching suit isn't the best one. By purchasing a matching set you are limiting the wear-ability of the suit. People will recognize the suit after a few times. No one wants to hear, 'Dave will be the guy in the navy blue pinstripe. He always wears it to weddings.' Instead, think about purchasing separate pieces rather than a complete set. The salesperson can help you with this. 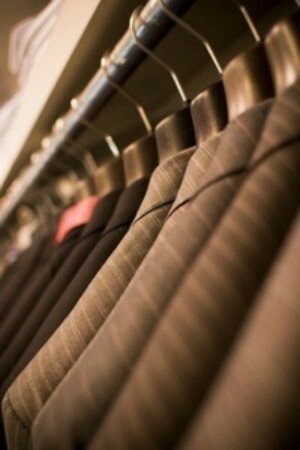 For men, consider purchasing a strong suit jacket that will go well with a variety of styles. Choose the jacket first, and then cater the rest of the suit to match. If money is a factor, by one piece at a time starting with the jacket. Men should consider buying two sets of pants and match a different shirt and tie combo to each set. This provides a full suit with a variety of wear options. Some occasions only call for the pants, shirt, and tie. Others require the more formal jacket as well. Mix and match ties with shirts and create an variety of looks. For women, the same suit principals apply. While men change the look of their suit by wearing or not wearing the jacket, women choose to wear the skirt and jacket or pants and jacket. Most pre-packaged sets come with only one: a skirt suit or a pant suit. Try to create your own set to build a suit that features both options. Purchase a strong suit jacket in a neutral color. Avoid something seasonal or memorable such as light yellow or strong purple. Then, find a matching pair of dress pants and a straight skirt. These can be in the same color palette but different shades to add interest to the suit. For example, a chocolate brown jacket can pair with a lighter taupe pant. As with the men, look for a bold shirt for underneath that can be changed to create different looks. Details around the color such as stitching or lace can create an interesting detail without a lot of cost. There are some ideas to avoid. While one white shirt is essential for formal occasions, try to purchase shirt/tie combinations in a variety of bold colors. 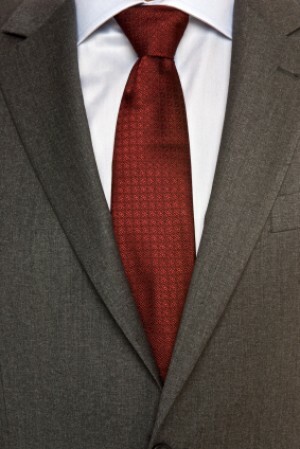 Often just by wearing a different bold tie and shirt color, the plain black suit looks completely different. Plan ahead. While purchasing, avoid pinstripes since they limit the variations of the suit combinations, but do purchase ties in interesting but subtle patterns. Often if one tie holds a few different colors, it can pair with different shirts, offering more variety. If a pre-paired suit is the only option (sale or discount pricing), purchase plain black as it can later be combined with a variety of pieces. Avoid the sales pitch of the 'complete suit' which includes a vest. Men's magazines suggest that the vest only be worn on the most formal of occasions. Spend the money on an extra set of pants instead. Another area to avoid, the ill-fitting but lower priced suit. "If it doesn't fit, don't buy it, even if it's on sale. Never sacrifice fit for color, fabric, or price. Don't get caught up in an embarrassment over the sizes," cautions MBA Style Magazine. Don't be afraid of change. It's not the generation of the Sears pre-paired suit of our grandfathers anymore. In The New York Times' article 'Two Easy Pieces: Buying a Suit' the writers explain, "The two parts of a suit do not come glued together. You can and should wear them separately. We used to call this stretching a buck. We now call this process fashion."